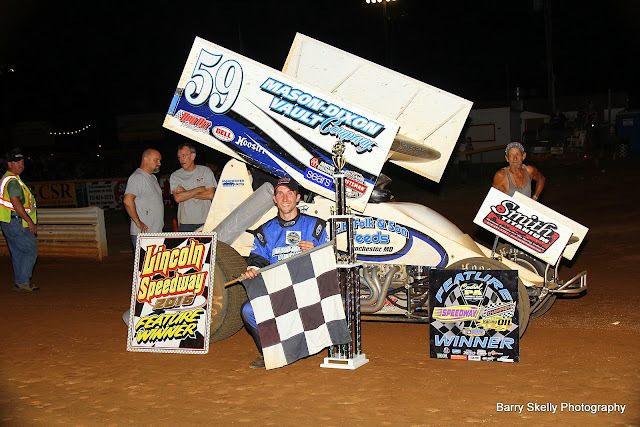 ABBOTTSTOWN, PA 8/27/2016 – Jim Siegel picked up his first win of the year and became the 15th different winner in 20 races in the 25-lap feature at Lincoln Speedway Saturday night. Handicapping placed Siegel fourth for the start and he drove into the runner-up spot by the end of the first lap. From there, he chased down outside front row starter and race-long leader Tim Wagaman to make the race-winning pass on lap nine, one lap after the event’s only caution came out for Adam Wilt, who oiled the front stretch after getting a hole in the oil pan. Siegel drove away from the field for his 13th career win in the Pigeon Hills, moving him alongside Neil Haight and Steve Stambaugh for 24th on the all-time Lincoln win list. Wagaman settled for second, crossing 4.16 seconds behind the winner, with defending track champ and hard charger Brian Montieth advancing from tenth to finish third. Keeping pace and holding on the Lincoln points lead with one point race remaining was Alan Krimes, who came from 11th starting spot. Rounding out the top five was Gerard McIntyre, Jr. Completing the top ten were Danny Dietrich, Cory Haas, Robbie Kendall, Austin Hogue, and 16th-starting Chase Dietz. “We’ve been getting better. We had a decent start to the beginning of the year and then we just started struggling,” said Siegel, “We made gains and then struggle and make gains and struggle. About the last month here, we put a Maxim together and we’re back on Pro Shocks and started from scratch. We’ve been getting better every week. Starting spot helped”. Heats for the 28 410 Sprints were won by Krimes, Montieth, and Danny Dietrich, with Kevin Nagy winning the consolation. Lady driver Brie Hershey of Dillsburg led every lap in claiming her second career Lincoln win in the 25-lap “358” sprint car feature. 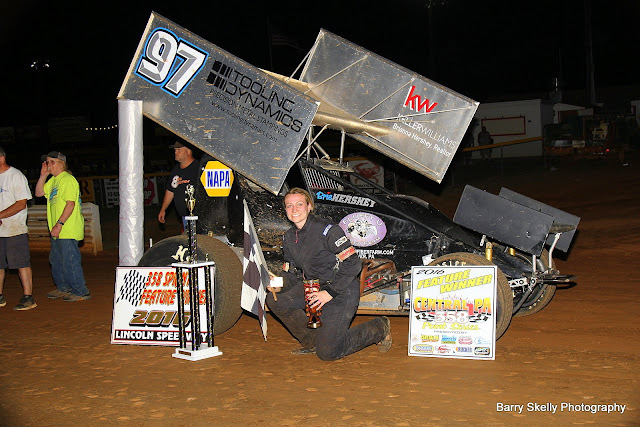 Hersey dominated the entire way in the finale of the Nouse Signs and Graphics “358” Sprint Car Summer Series, crossing 1.19 seconds in front under the checkered. Doug Hammaker finished fourth and took home the $1,000 top prize in the Summer Series after coming into the final race with a slim one-point lead over Kevin Nouse. Starting on the outside of the front row and crossing second was Phil Walter, who raced with Matt Campbell for the runner-up spot over the final laps, with Campbell picking up the hard charger award for coming 16th starting spot to finish third. Behind Hammaker in fifth was Kyle Denmyer, who finish third behind Nouse overall summer series points. Sixth through tenth were Adrian Shaffer, Nouse, Tyler Esh, Jeff Halligan (who came from the back after a multi-car incident on lap four), and Matt Findley, who came from 21st starting spot. Points leader Chandler Leiby was involved in a turn two crash on lap four, ending his night. His 22nd-place finish, combined with Campbell’s third-place finish closed Campbell to within 15 points unofficially with two point races remaining. Heats for the 38 358 Sprints were won by Hershey, Walter, Dwight Leppo, and Jeff Rohrbaugh, with Findley winning the consolation. East Earl’s Josh Bloom started on the pole, led every lap, and claimed his first career win in the 20-lap street stock feature. The win came by 1.16 seconds over third-starting Randy Zechman, with Greg Diehl, Jamie Zentmyer, and hard charger Jimmy Combs, who came from 15th starting spot. Heats for the 28 Street Stocks were won by Zentmyer, Mike Potts, and Kyle Martin, with with Josh’s dad Ryan Bloom winning the consolation. Next Saturday night, September 3rd, Lincoln Speedway celebrates the Labor Day holiday weekend with a three division show featuring the Lawrence Chevrolet 410 Sprints’ final point race of the 2016 season. Will Alan Krimes hang on to claim his 2nd track title in three years, or can four-time defending track champion Brian Montieth overcome Krimes’ sizeable point lead to record yet another track title? The 358 Sprints will also be competing in their next-to-last Keizer Aluminum Wheels point race, along with the Super Sportsman who will be competing in their final tune-up before their big Keystone 50 race on September 17th. Rounding out the evening will be a spectacular FIREWORKS display. As usual, general admission gates will open at 5:30 PM with qualifying heats getting underway at 7:30 PM.